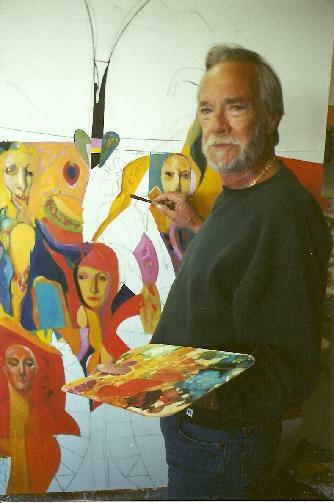 Jack attended Carnegie Institute and in 1954, graduated from the Art Institute of Pittsburgh. His diversified body of work has included news feature, illustration, sports cartoons, political caricatures, show business portraits and humorous art, as well as "serious" paintings. Jack's style ranges as widely as his subjects, from meticulous representationalism to free expressionism. "What Art is about", Barrett states, is "To record a likeness or gesture in a dramatic spontaneous moment." Jack's myriads of artistic accomplishments include: teaching, sculpture, murals and acting. He is also the recipient of many awards and honors including first awards for newspaper illustration. His work has been published by Rockport Publishers, Massachussetts, Contemporary Graphic Artists, Gale Research Company, New York, Comic Art & Caricature by Roy Paul Nelson Contemporary Books, Inc., Chicago and McGraw-Hill, Inc., New York, College Custom Series (Art). Jack has and continues to exhibit his work in many fine galleries throughout Florida, the United States and in Canada.